Here we look into the commercial activities of an enterprise through a prism of energy dissipation to understand the conversion of investment into income. 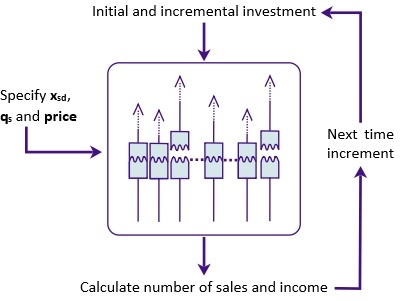 The enterprise model is able to convert investment over time into income through a series of simulated sale events. Energy dissipative systems are everywhere from the mattresses on which we sleep to our bones and joints and the weather. 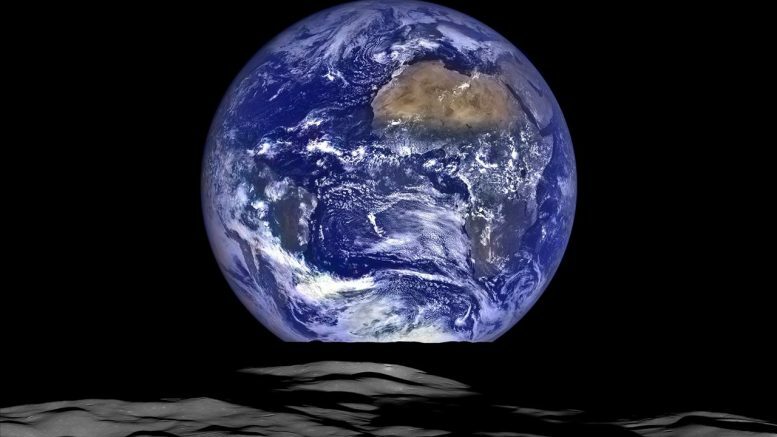 Looking at the earth from afar we can recognise the absorption of solar energy to animate its terrestrial environment. Earlier we followed the energy flows and transformations through the conduits of a Great Global Refinery to imagine a connected ecosystem that includes the economic activities of nations and the commercial activities of their enterprises. In sale events we have identified energy transformations that are characteristic of an energy dissipative mechanism, occurring when a critical threshold is crossed. They are like physical fractures, although in this case it is the resistance of consumers not to acquire the object of their desires that is broken. Now we can assemble the commercial activities of an enterprise from its constituent sale events that are brought about by the raising of a value surface to traverse that key threshold. Below we set out an algorithm to do this. This model of an enterprise follows a series of steps to elevate a value surface and thereby achieve its essential commercial transactions. Along the way some assumptions are made and these are shown in italics. You have investment together with a plan to spend this over a period of time. The duration of investment is broken down into a series of incremental payments. The assumed increment duration can be nominal at first. Later we will show that this cyclical period is an important indicator of business performance. You have identified a consumer population with a statistical variation in their propensity to value the goods you have to offer. We start with a number of consumer product interactions (CPIs). We will assume 100 initial CPIs are created – this is a nominal value. 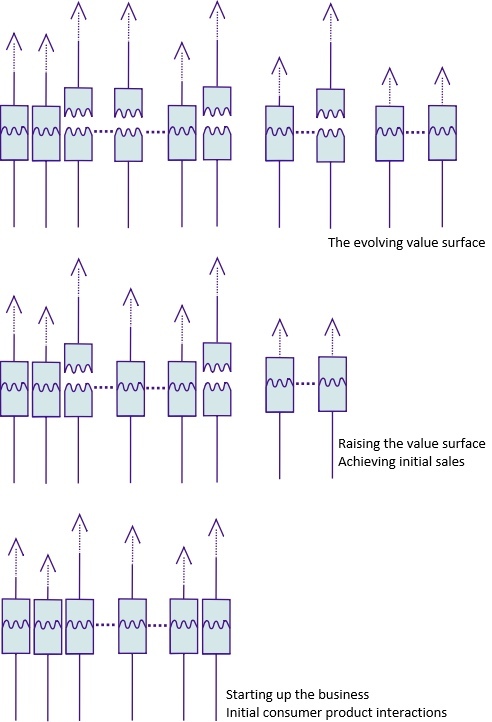 Sale events occur when consumer-perceived value exceeds a set price associated with the goods. With each product sale the investment associated with that successful CPI is “dissipated”, the interaction deactivated and the sale price is returned to the enterprise. Each product sale also has a second effect, with qs new CPIs being formed and made available to receive their share of any future investment. For a sustainable business it is necessary that this parameter qs is greater than zero. For the next and subsequent time increments, deactivate those CPIs associated with new completed sales, recruit qs additional CPIs for each sale event, so that these newly active CPIs receive their share of further incremental investment alongside the older, still active CPIs. For each incremental investment recalculate the income returned to the enterprise. Investment is input into an enterprise over time. Income from sales events is one important output that is easily measureable. Indeed it is essential to know. There is another output of the enterprise model that is equally important to recognise. As well as investment that is channelled through CPIs to initiate sale events, at any time there will be some of the investment that is held in CPIs as an appreciation of value, but at a level that is less than the set price. We shall refer to this residual investment as “value surface energy”, which is a form of potential held within the raised value surface at each point in time. 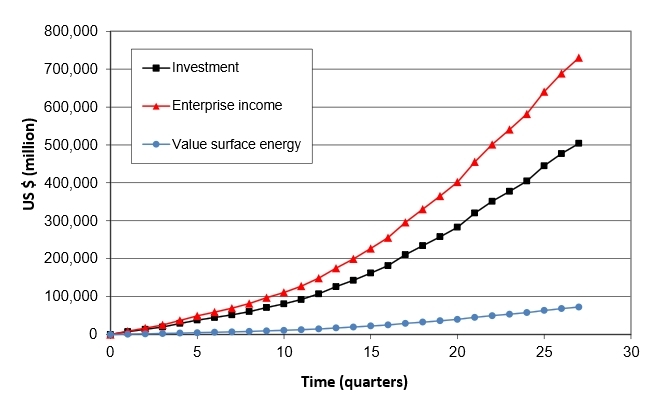 Depending on the values of the two parameter xsd and qs, together with the price, the enterprise model is able the convert input investment into the income and also the value surface energy as shown below. Value surface energy requires careful consideration. Most energy dissipative systems have an equivalent stored energy component. It is the energy in a charged battery. In viscoelastic materials it is the strain energy stored within their elastic components. Fracture surfaces have a surface energy retained from the energies that caused the original fracture. However, value surface energy has a prima facie case for suffering what Léon Walras called the intimacy of economic phenomena, due to “a lack of common measures for these psychological phenomena”. Measurement of the value surface energy will be a subject for future deliberation. The input investment for this example is taken from the quarterly reports of Apple Inc. filed with the US Securities and Exchange Commission between 2009 and 2014. The simulated income and value surface energy provides a close fit to the real commercial data estimated from the same filings.